Grab your picnic basket and blanket and prepare for a fabulous Picnic! 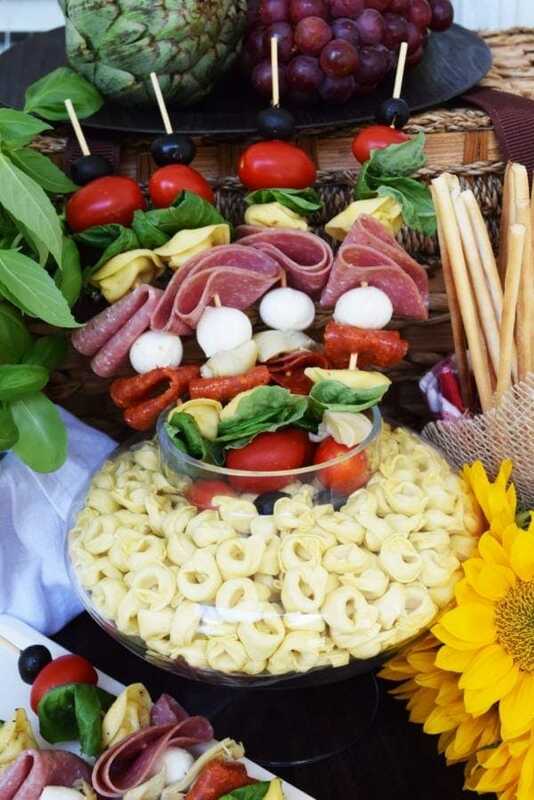 These scrumptious Antipasto Skewers are the perfect start to a day of fun in the sun! Summer is in full swing and it’s the perfect time for a picnic. Al fresco dinning is delightful when the weather is nice. Whether you head to the beach, the park, or your back yard, picnics are packed full of fun. Foods that are easy to transport and easy to eat are a must. 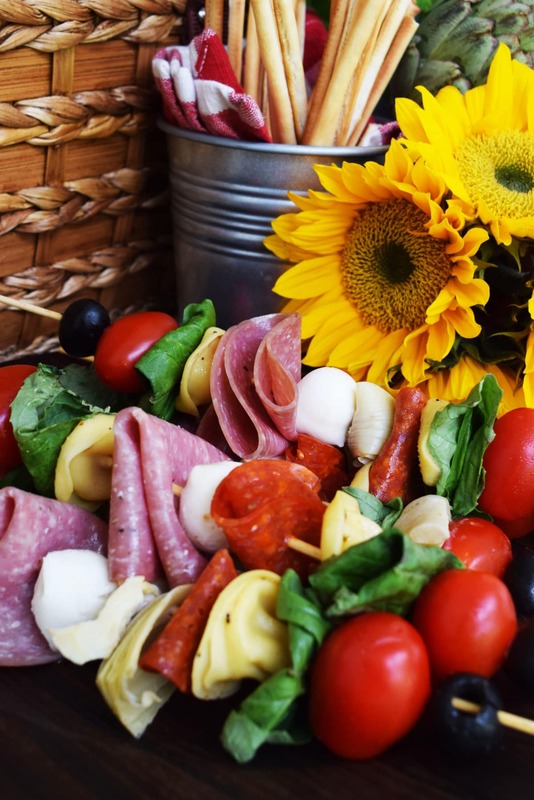 Take along bite sized bites like these Antipasto Skewers, Sandwiches, Pasta Salads or hearty greens like a Strawberry Kale Salad, that won’t wilt in the heat. Fruit is a wonderful choice, as well as a cheese or charcuterie. And don’t forget your favorite refreshing fun fruity beverage, like this Strawberry Lemon Drop, cocktail or mocktail version. Just remember recipes don’t have to be boring and bland to be easy. My taste making friends from Sunday Supper Movement have come together to bring you wonderful ideas to bring life to your picnic! When planning any gathering I always like to throw in some special decorating touches that make it “Pretty”ya’ll. For inspiration build your ideas around your food items. To start, I set down a table cloth that added a pop of color and a barrier to the ground. Then a beautiful basket is backdrop to bring in height, dimension, and hey you had to carry that stuff in something right. 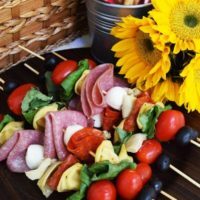 With these Antipasto Skewers in mind, I added some store bought bread-sticks in a basket with a red & white napkin, plated some green and red grapes around an artichoke, which was used in the recipe. To hold up the skewers, pasta was placed in a pretty glass dish which also added interest to the space. Flowers bring color, these were on sale or I would have used come dried ones I had at home. I wrapped them with a napkin that matched the one that went with the bread-sticks and some burlap ribbon tied to finish (I already had this in my closet). Lastly to add a touch of greenery, I wrapped a basil plant with a simple white napkin and the setting is complete. These simple touches make your guests feel special and the occasion more fun! Those little details go a long way! Making everyone feel special is what Southern Hospitality is all about!! TIP: Cook the entire package of tortellini and use extra for dinner! This Creamy Italian Sausage Tortellini Skillet is a family pleaser! Come join in all the fun and let’s be social! Cook tortellini pasta according to package instructions. Drain and rinse with cold water. Toss in dressing and let marinate for 15 or until ready to assemble. Discard marinade. For each skewer, thread an olive, tomato, basil leaf, tortellini, basil leaf, folded salami slice, mini mozzarella ball, tortellini, basil leaf, folded pepperoni slice, artichoke heart, tomato, olive. You can switch up the arrangement if you like. You can find this as Meal Plan Monday and Weekend Potluck. Oh I love this idea! You did such a nice job of making them pretty. I tried this once and they did not turn out as pretty as yours and of course they look delicious too! Thank you Denise! They were so easy to put together! I love these antipasto! What a great way to enjoy antipasto! These look delicious! I love this idea! Thank you so much!! They are fun and tasty! This looks so fun! I know a few households that would go crazy over this idea! Sharing! These would be great for a picnic, for sure! Oh my goodness, Nikki. You certainly do know how to pretty up a picnic. Love the elegant touch of bread sticks, too =) Pinning! These are gorgeous, Nikki! And so adaptable to your favorite ingredients!! Aww!! Thank you so much! I love to throw my “little touches” when I plan a gathering! Thank you so much for sharing!